This is a Yerushalmi Hanukiyyah. 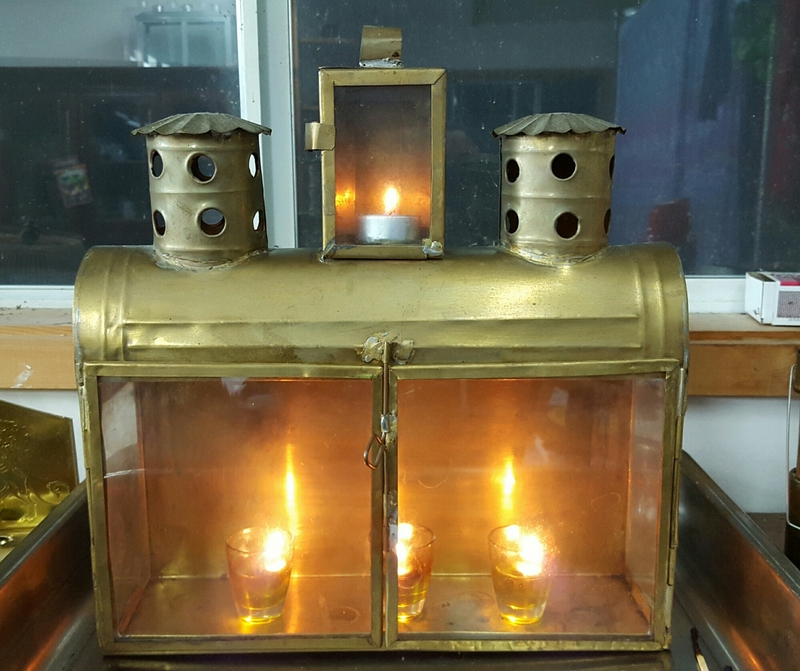 That is, it’s an antique Hanukiyyah, made in Jerusalem at least a hundred years ago, of brass which was, like so many things, probably salvaged from the sheet brass used in old automobile reflectors. Not very old in Jerusalem years! I bought it in downtown Jerusalem, six or eight years ago. I was about to get on my bus–the number 21 bus that goes to the German Colony, Dov–when a flash of brass and glass caught my eye. Before and during holidays in Israel, tables go up on every reasonably flat surface, and the place becomes a heaving jumble of street sales. Most of it is table cloths, needful supplies, decorations…And occasionally something very special. This was so very, very special that I stepped backward off my bus, nearly causing the sort of cultural disaster that only happens in ethnic groups like mine, where men and women are never supposed to touch one another in public. But I couldn’t stop for that. I had to run and make my deal with this guy before he got away or sold it to someone else. No, impossible. This Hanukiyyah is mine! He hailed from an old Mizrachi Yerushalmi family, by way of Cairo. That is to say, after having been dragged off into exile from Jerusalem by the Persians, Babylonians, Greeks, or Romans, his family either made it directly to Egypt, or got there courtesy of Queen Isabella in 1492, when many of those who were exiled from Spain–Portugal headed for Cairo to join family there. In the 1500s there was a migration back into the Holy Land, with further tricklings here and there, augmented by serial expulsions of Jews from Cairo, minus their wealth…. But not without their breathtaking skill at making something out of nothing. In this we excel, having had to do it over and over and over and over and…. How much is it? Kamah zeh??? Two thousand???? I don’t have that much!!!! Yes, I am a Jerusalemite-ess!!! Beseder, aval ain li col-kakh harbe kesev ka’zeh…Fine, but I ain’t got that much money! We settled at rather more than I would have liked to have parted with…But he saw that my eyes were firmly dilated and fixed on this magical carpet ride of a light box…And I reminded myself that when one finds an object of great power and beauty, it is not an accident, and we must pay whatever we can raise, to draw it near to us. And now I sit, on the other side of the world, and dream of the magic this Hanukiyyah has brought me. Like the time a tour guide tapped at my open door, in my ancient Jerusalem neighborhood where the custom is to light one’s Hanukkah oil lamps out of doors. I had mine blazing inside this very Hanukiyyah, balanced on a stool in the stone archway of my home. The guide explained that he had a group of college girls from Petah Tikvah, and could they come in and listen to me play the violin? Oh dear, I had not counted on anyone actually hearing me play! I was just doodling, you see….But by that time my living room was full of giggling fresh faced girls. To put them off the violin, I ran in the kitchen and fetched the box of fresh sufganiyot I had bought for a party later that evening; also mugs and hot cider. Soon they were giggling and nibbling, and I pitched into an old-timey American fiddle tune and made their toes tap inside the ballet flats in which every Israeli school girl runs over the hard stone pavers. A sufganiyah…now that is the substance of which years of joy are made. It is nominally a filled doughnut. But nothing, nothing like American jelly donuts, ugh, or even Boston Cremes! Sufganiyot are filled with things like pistachio, halvah, almond paste, and of course chocolate (bitter, milk, white), dates, oh, what endless varieties of flavors, and can be had in spelt flour too. But fried. Always fried, because the secret of Hanukkah is in the Oil. I felt like you took me on a trip to the streets of Jerusalem with your incredible descriptions. This was a beautiful read with images that sparkled with light, good flavours and smells, and interactions with tourists and Jerusalemites! I will have another Sufganiyot with pistachio please! A lady I worked with years ago used to make them and bring them in. I grew to really like them but haven’t even heard of them for years until I read your post! Vow, I thought I was reading some tale from Arabian Nights. Infact I was irked when it ended. Irked, hey???? Well then, perhaps the story has just begun…. Beautiful Laura although I had to look up some words. Knowledge creates desire as the ad makers know well. Now I want some Sufganiyot. Lovely little story. I was right there with you. Thank you, Anne! I’m looking to the magic of the Hanukkah lights to drag me out of my current doldrums. Thank you! I’m glad you found your way to the word. I had never seen anything quite as beautiful as my hand-wrought brass Hanukiyyah…we shall see it all blazing soon…. Funny who you bump into on other blogs. Oh? Who are you bumping into now? Laura writes very interesting posts, I think you’d like reading her blog. It is fun to see others in our ‘communities’ show up commenting or liking blogs/posts of other blogs we read. It’s like bumping into a friend on the street! It’s so like that. Like dandelion seeds floating around and landing on a blog near you! Yes it does happen quite often. Thank you, and yes, a plate full would do just nicely…I’m having a yen for chestnut cream filled ones! I haven’t been able to eat the delectable items since gluten intolerance has ruined my enjoyment of….But although it’s not the same, I have taken inspiration from Chinese and Japanese rice flour fried cakes, and I believe I will make a stab at frying up some gluten free sufganiyot! Date filling, yesh! Beautiful. The light shines. Praise the miracle of one day’s oil burning for eight. 😆. It gets better. Stay tuned. Even though I am something of a linguistic Luddite, I do like the modern term “repurposing.” I have a number of old and precious objects that have lived long and purposeful lives; and when that life was outlived, they turned into something new and useful. Hey presto! Reincarnation! Yule, Yule, Yule bells ringing on harness horses…not reincarnated, but since I just thought of it, maybe so….childhood memories of Belgian horses decorated with red ribbons and brass bells brought from the Old Country…bales of straw sticking into my dress…nice warm flannel blankets turning my white white white skin red red red….WASSAIL!!!! New England growing-up days! Hi Carol Anne! So nice to hear from you. I’ve been back in the States for a few years, caring for my father at the end of his life. He died over a year ago. I bought a tiny RV and have been traveling in it for almost nine months. I love it, so I’m going to keep doing it until I run out of money, and then I don’t know what I’ll do. What are you up to? Oh great! So cool that you’re back in school! Oh and, my blog is now at http://therapybits.wordpress.com/ If you would like to check it out and follow it. I visited your new blog and followed, but it won’t let me like or comment. Do you know why? Thank you for your kind words. I’m glad you enjoyed reading!